Temporary Location: Oyster Bay Waterfront Center. 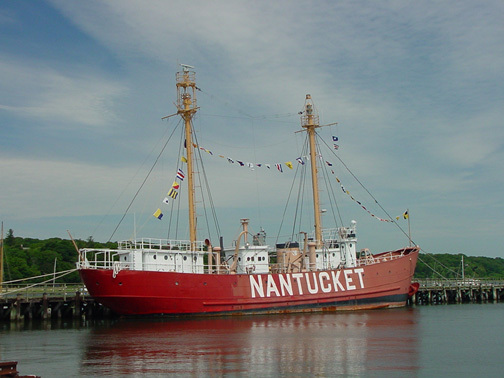 Description: 148 feet in length, two masts, red hull, with "Nantucket" in white. 1934: Nantucket Lightship (LV 117) is sunk by the liner Olympic. British government offers to pay for replacement, as reparations. 1936: LV 112 is launched, and put on station at Nantucket Shoals, where she spent nearly all her service. 1942-1954: Served as an examination vessel during the war. 1958-1960: Served as a relief vessel. The surrounding area: Oyster Bay is an old Long Island port. Cold Spring Harbor, including the Whaling Museum, is nearby. Public access? Can be seen from dock. Other information: Largest lightship ever built in United States.